What Do We Mean by Supply Chain Finance Structures? Our market-leading, London and New York-based Trade & Export Finance Group advises clients on transactions in a wide range of jurisdictions, with a special emphasis on emerging markets, including Africa, Asia, CIS, Middle East and Latin America. The Group advises well over 35 major trade finance banks and financial institutions as well as funds, corporate borrowers, agents and trustees, national and international organizations and the insurance market. Trade Finance Global named Sullivan & Worcester "Best Trade Finance Law Firm 2019" in its International Trade Finance Awards 2019. Global Trade Review named Sullivan & Worcester "Best Trade Finance Law Firm" in the GTR Leaders in Trade Awards 2016 and the GTR Leaders in Trade Awards 2015. The firm also won two GTR Deals of the Year 2016 awards. 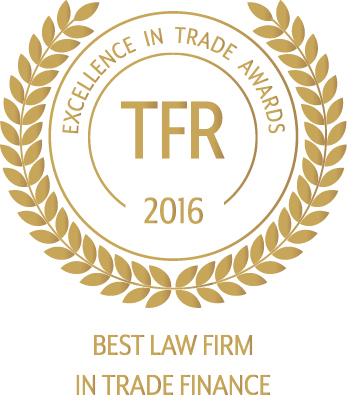 Trade & Forfaiting Review (TFR) named Sullivan & Worcester "Best Law Firm in Trade Finance" in its 2016 TFR Excellence in Trade Awards and 2015 and 2014 TFR Excellence in Trade Awards. The Legal 500 UK 2019 ranked the firm in Tier 1 for Trade Finance. The Legal 500 UK 2016 also named Geoffrey Wynne, Simon Cook and Mark Norris as Leading Individuals in this practice. IFLR1000 2017 recognized Sullivan & Worcester in the category of "Financial and Corporate" for its leading trade and export finance practice. Chambers UK 2017 named Geoffrey Wynne and Simon Cook as Ranked individuals in Tier 1 and Tier 2, respectively. Regulation: our partners regularly advise on regulatory (Basel III), bribery and corruption issues and sanctions issues particularly in connection with trade and export finance. Advising Deutsche Bank as documentation agent in relation to the annual $1.8 billion pre-export syndicated facility provided to the Ghana Cocoa Board. This financing typically has a syndicate in excess of 30 banks and is the largest soft commodity financing in Sub-Saharan Africa each year. Representing a consortium of international Scandinavian banks on a buyer finance commercial loan to an East African borrower to finance the $400 million purchase of telecommunications equipment. Advising Dints International, a specialist equipment supplier in Africa, on a unique Vendor Managed Inventory contract with one of West Africa’s largest gold producers. This transaction was supported by the UK’s export credit agency, UKEF. Advising JP Morgan as Mandated Lead Arranger and Agent on a US$multi-million loan made by UKEF under its direct lending facility to the Kurdistan Regional Government to finance the preliminary scoping phase of a significant US$1.2bn contract with the British water engineering company Biwater. Advising a leading international bank on a $175 million commodity financing facility for a UAE/Pan-Africa trading group, involving the taking of security over commodities in multiple African jurisdictions. Advising a major international bank on a major jurisdictional survey relating to structuring and implementing commodity repos in several jurisdictions around the world, covering a variety of commodities including agriculture, metals and oil. Advising a major international bank on receivables discounting agreements for a number of the bank’s clients, including receivables arising from sales of coffee. Advising the UK subsidiary of a Nigerian bank on a $70 million commodity financing facility to UAE/Singapore borrowers involving the taking of security over commodities in multiple African jurisdictions. Advising a regional development bank in Africa on a $5 million equipment import and installation facility for a Ghanaian corporate borrower and a Chinese supplier involving the taking of security over certain equipment and other assets. Advising a number of banks on various facilities to energy companies to finance the sale and purchase of oil through the Kenyan oil open tender system (OTS). Advising a hedge fund in relation to the provision of a prepayment facility to an international mining and mineral exploration company to finance the operations of a mine in Morocco. Advising a club of international banks on an ECA supported financing in excess of $170 million in relation to an electricity infrastructure project in Zambia, supported by a government guarantee. The financing involved both an ECA and a commercial facility. Advising a number of international banks on the use of credit risk mitigants and the application of Article 194 of CRR. These include insurance policies, cash deposits and receivables. Advising the International Chamber of Commerce (ICC) and its members on the application of Article 194 to various rules namely UCP 600 (standby letters of credit only), ISP98, URDG 758 and URR 725 (regarding reimbursement obligations).